Inspiration is found in the natural world around my rural home. My shallow relief carving and small sculptures are intricatly carved illustrations that portray insects, frogs and other creatures in nature's environment. To me, these porcelain pieces point out the importance of life in the little things of nature that most of us tend to not notice during our busy lives. With them I hope to arouse quiet, pleasant, memories in the minds of the viewers. My porcelain carving style evolved during 25 years of working with clay. The earliest carvings were made using my stoneware pots and tiles to carve upon. 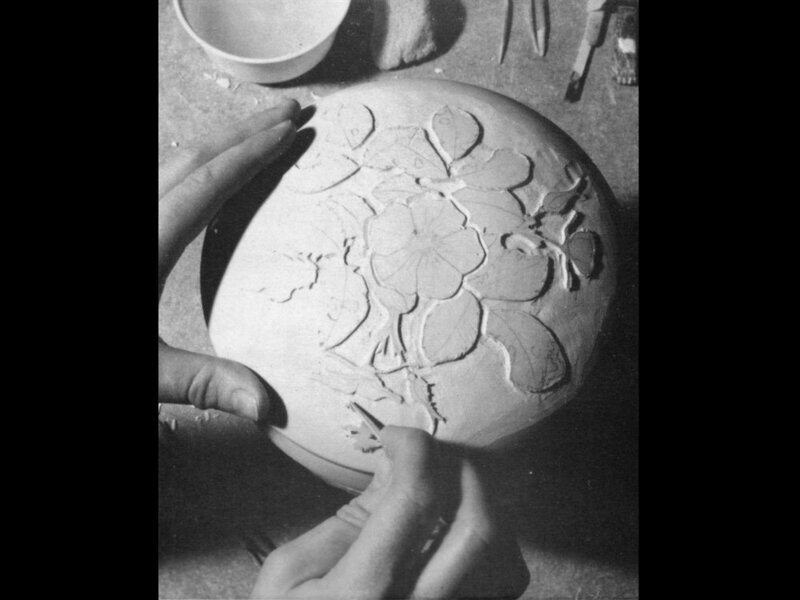 As my interest in carving grew I began using porcelain clay because of its fine particle size and whiteness when fired, I strove to include more detail while using shallow-relief carving techniques. A style of composition developed that involved layered images carved from the damp clay surface of wheel-thrown, porcelain boxes. The layers intermingled foreground, middle ground and background imagery. A favorite, complex, subject grouping dealt with what occurs around water: above, at, below, and reflected from the surface of the water. Another favorite scenario: insects or tree frogs in the branches and leaves of the trees and grapevines where they could be found. Tools that I fashioned from bamboo were used to remove small amounts of damp clay while sculpting the shallow-relief design. Celadon or pale blue glazes enhanced the shallow carvings, softening the presentation and adding a feeling of depth to the composition. When carved frogs and toads became more three-dimensional, I felt that the results did not fit with the more delicate shallow-relief carving on the boxes. A separate, more sculptural carving style in porcelain emerged as I began an exploration of miniature sculpture in the forms of netsuke and ojime. Many of those I chose to leave unglazed to preserve the sculptural influence of light and shadow, instead of using glaze that tends to flatten the sculpted form's surfaces. For about five years, I wrestled privately with aesthetic arguments over the limited possibilities that the use of porcelain offered the sculptures. Whether pieces were glazed or left unglazed, I found no resolve with how to further enhance the sculptural pieces within the limitations while using porcelain clay as the carving material. In the early summer of 1995, I selected a piece of boxwood and carved my first wood netsuke. This marked a transition away from a twenty five year creative affair with clay. The carved porcelain pieces presented for sale in the Carved Porcelain Shop are from a limited collection of works that I have reserved since the mid 1990's.